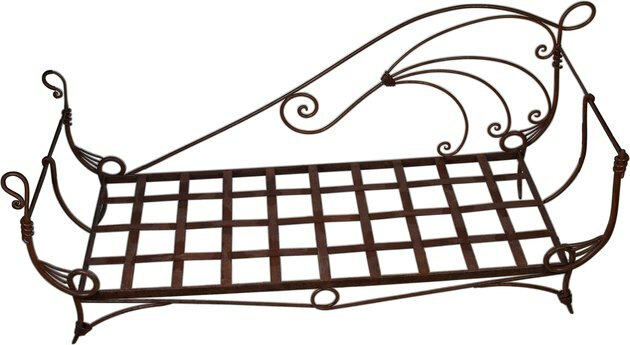 Metal bed frames -- sometimes known as Hollywood frames -- consist of angle iron formed into a rectangle, with legs and casters. The box spring rests on the horizontal portion of each piece of angle iron. Metal bed frames designed to support full-size mattresses measure 54 inches wide by 74 inches long, between the inside surfaces of the upright portions of each rail. Adding rails helps prevent sagging between the head and foot of the bed. Slats across a metal bed frame provide added support for a mattress. Mark along the horizontal portion of each long rail every 6 inches, beginning at the head rail, all the way to the foot rail. Cut each piece of 16-foot-long stock lumber into three pieces of 54 inches long and one piece of 30 inches long, which will produce 12 pieces that are 54 inches long and four pieces that are 30 inches long. Set the 30-inch pieces aside for other projects. Smooth the ends of each 54-inch board with coarse and medium sanding blocks to remove splinters. Lay each slat across the open span between the long bed rails, centered on the marks made on the horizontal portion of each rail. Drill a one-fourth-inch diameter hole through each end of each board and through the metal bed frame, one-half-inch toward the center of the bed from the vertical face of each long rail. Put a fender washer on each machine screw and insert it in one of the holes, all the way through the wood slat and the metal frame. Slide a fender washer on the machine screw on the underside of each metal bed rail, followed by a nut. Place the head of a flat-head screwdriver in the slot of the machine screw while tightening the nut by hand. Slip an open-ended box wrench onto the head of the nut. Turn the nut until it won't tighten any more without causing the fender washers to bite into the wood. Repeat for each end of all 12 slats. Place a full-size mattress on the bed, along with the desired bed linens. Move the bed frame outdoors or in the doorway of a workshop. Make sure all exhaust fans are running and all doors and windows are all the way open. Mark along the horizontal portion of each long rail of the metal bed frame every 6 inches, beginning at the head rail, all the way to the foot rail. Don wrap-around eye protection, ear protection and a NIOSH-approved respirator. Cut each 20-foot piece of one-half-inch-thick-by-2-inch-wide steel bar stock into four pieces of 54 inches long and one piece of 24 inches long, using the cutoff wheel on a bench grinder, which will produce 12 pieces of 54 inches long and four pieces that are 24 inches long. Set the 24-inch pieces aside for another project. Deburr all surfaces at each end of each of the 54-inch pieces of steel bar stock, using the grinding wheel. Lay the pieces of bar steel across the open span between the two long sides of the metal bed frame, with their ends centered on the marks made on the frame. Don full leathers and a welding helmet, keeping the wrap-around eye protection in place. Make a flat fillet weld where the ends of each steel slat meet the upright portion of each long rail of the bed frame. A flat fillet weld fills the space where a vertical and horizontal surface meet, creating a triangular profile when viewed from the side, according to the Miller Welds "TIG Handbook for Gas Tungsten Arc Welding." Allow all welds to cool for four to eight hours. Use a 40-grit wheel on a right angle grinder to smooth all welds, followed by an 80-grit wheel. Apply three coats of rust-inhibiting enamel to all slats and welds, allowing the enamel to dry overnight between coats.